Unless you’ve been living under a rock, you would have noticed that there’s a craze sweeping the world. The latest trend around involves taking selfies (or photos of oneself, if you’re not familiar with the term), and everyone is doing it. Someone has even gone so far as to ‘invent’ a selfie-stick- a pole which you attach your camera to, so that you can hold it out further and include more people in your selfie picture. In my mind, the only people that really benefit from a selfie-stick are people with short arms, and the sellers of this invention, but it does prove that there is a market for all things ‘selfie’- including books. 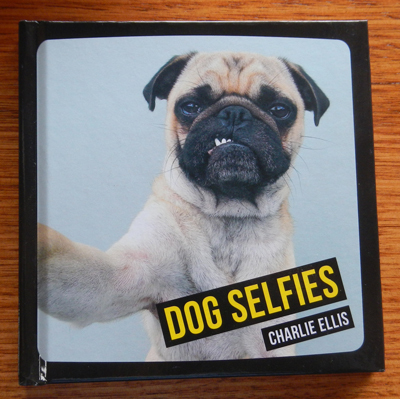 As if to prove that, someone named Charlie Ellis has compiled a collection of photographs featuring dogs and cats taking on the trend, and has put them into book format. 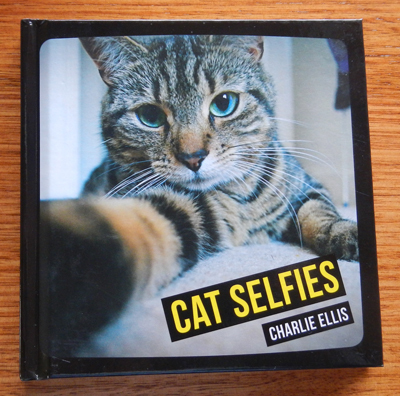 This book contains over fifty photos of pet cats in varying selfie poses. Many of the pictures feature captions (complete with hashtags a la the websites Twitter and Instagram), Facebook-style comments or photo collages. In other words, this is a very new-generation styled book which adopts many internet-based ideas. There are also little ‘profiles’ of some of the cats, including their names, nicknames, likes, dislikes, and other facts. Unless you’re an avid cat lover, or your pet actually features in this book, I can’t imagine why you would buy it. Following the exact same format as the book above, Dog Selfies also showcases over fifty selfies- this time of the canine variety. Once again, it’s a matter of, ‘why would you buy it?’ but it’s safe to say that the dog version has a more interesting variety of pictures than the cat version (due to their more animated facial expressions). 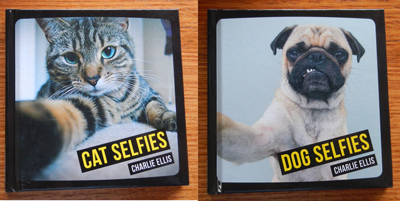 This book (and the cat version above) would make a good gag gift for that person you know who’s always taking photos of themselves, but other than that, I can’t see why you would really want to spend around $20 on each of them! Would you buy a TV show-themed cookbook?